The Washington Post has published a new column by Jamal Khashoggi in which he warns that governments in the Middle East "have been given free rein to continue silencing the media at an increasing rate." The Post published the column Wednesday, more than two weeks after Khashoggi was last seen entering the Saudi consulate in Istanbul. Turkish officials say he was killed by Saudi agents. The Saudi government has denied it. Post Global Opinions editor Karen Attiah says she received the column from Khashoggi's assistant a day after he was reported missing. Khashoggi writes that actions like imprisoning journalists and seizing control of newspapers "no longer carry the consequence of a backlash from the international community." He says, "Instead, these actions may trigger condemnation followed by silence." President Donald Trump has suggested that the global community has jumped to conclusions that Saudi Arabia is behind Khashoggi's disappearance. The Washington Post plans to publish a new column by missing journalist Jamal Khashoggi in which he discusses the importance of a free press in the Middle East. The WashPost PR Blog says Khashoggi filed the column just before he disappeared. It will be published online Wednesday night in the U.S.
Khashoggi was a Post Global Opinions contributor who had written opinion pieces critical of the Saudi crown prince. He was last seen Oct. 2 entering the Saudi consulate in Istanbul to pick up paperwork he needed to get married. Turkish officials have claimed Saudi agents killed and dismembered him. Saudi Arabia has denied the allegations, but provided no evidence he left the consulate. The Post also plans to publish a page dedicated to Khashoggi in its opinions section Thursday. America's top military officer has met with Saudi Arabia's defense chief amid deteriorating relations between the two nations after the disappearance and apparent death of a Saudi journalist who lived in the U.S.
Gen. Joseph Dunford, chairman of the Joint Chiefs of Staff, met Wednesday with Gen. Fayyad Al-Ruwayli, Saudi Arabia's chief of the general staff. The meeting comes amid accusations that journalist Jamal Khashoggi was tortured and killed two weeks ago while visiting the Saudi consulate in Istanbul to pick up paperwork he needed to get married. Asked Tuesday if the Khashoggi matter would come up during the meeting, Dunford declined to say. He said it's premature to say if Khashoggi's disappearance will have an impact on U.S. military relations with Saudi Arabia. U.S. Secretary of State Mike Pompeo says America takes the disappearance of Saudi writer Jamal Khashoggi "seriously." Pompeo made the comments to journalists after leaving Turkey on Wednesday during a quick visit that included a talk with President Recep Tayyip Erdogan. Pompeo said Erdogan "made clear that the Saudis had cooperated with the investigation that the Turks are engaged in and they are going to share information." Asked if he heard or asked to hear audio of Khashoggi's alleged slaying, he said: "I don't have anything to say about that." A State Department spokeswoman later said Pompeo had not heard any such audio. Pompeo stressed that the U.S. and Saudi Arabia have important links, including working on countering Iran. However, he said: "If a country engages in activity that is unlawful, it's unacceptable. No one is going to defend activity of that nature. They need to simply say what happened." Turkish police have arrived at the residence of the Saudi consul in Istanbul to conduct a search over the disappearance and alleged slaying of writer Jamal Khashoggi. The police arrived Wednesday at the home. They had wanted to search Tuesday night but did not have permission from Saudi Arabia. The search comes after investigators searched the consulate earlier this week. German Foreign Minister Heiko Maas is putting a planned trip to Saudi Arabia on hold pending the outcome of an investigation into the disappearance and alleged slaying of Saudi writer Jamal Khashoggi. Maas told reporters Wednesday that, "regarding my travel plans ... we will wait for the time being." He called the case "extremely worrying ... and disturbing" and demanded a complete and quick clarification of what has happened to Khashoggi. Khashoggi vanished Oct. 2 during a visit to the Saudi Consulate in Istanbul, and Turkish officials have claimed Saudi agents killed and dismembered the Washington Post columnist. Maas says once the Saudi government makes an expected statement, "we'll use that as an opportunity to consider again if a trip to Saudi Arabia at this time makes sense or not." U.S. Secretary of State Mike Pompeo has met Turkey's president and foreign minister over the disappearance and alleged slaying of Saudi writer Jamal Khashoggi. 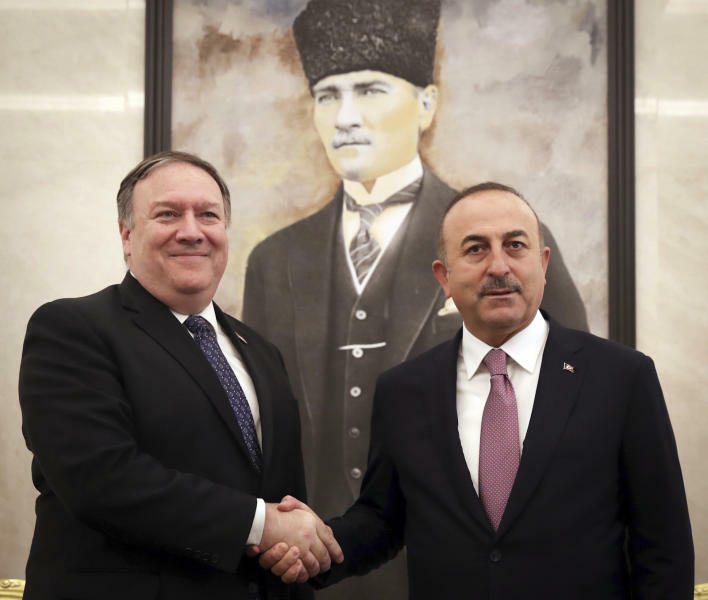 No details were immediately released about the talks Wednesday between Pompeo and President Recep Tayyip Erdogan and Foreign Minister Mevlut Cavusoglu. The three posed for photos before their meetings, but said nothing in front of journalists. 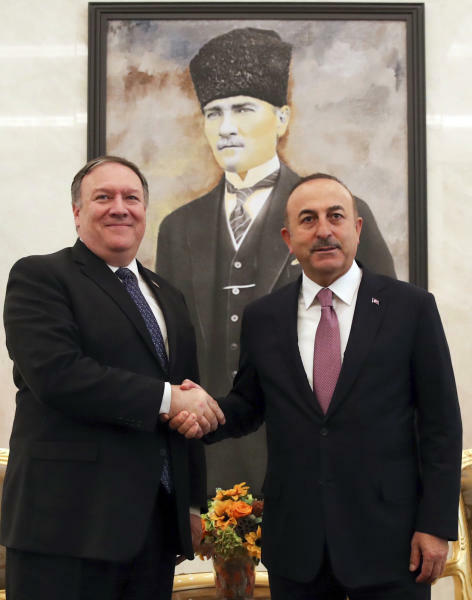 Pompeo held separate meetings with Erdogan and Cavusoglu, each lasting around 40 minutes. Pompeo had just come from Riyadh, where he spoke Tuesday with Saudi King Salman and Crown Prince Mohammed bin Salman. Khashoggi went missing on Oct. 2 after entering the Saudi Consulate in Istanbul. Turkish officials say they fear Saudi agents killed and dismembered him. Saudi Arabia has denied the allegations, but provided no evidence he left the consulate. Turkey says it is awaiting final permission from Saudi Arabia to search the home of the Saudi consul in Istanbul as part of an investigation into the disappearance of Saudi journalist Jamal Khashoggi. Interior Minister Suleyman Soylu told the state-run Anadolu Agency on Wednesday that Saudi Arabia has "accepted" a request for a search of the official residence but had not yet given its final consent. Soylu said: "As soon as (Saudi Arabia) gives the consent, steps will be taken toward investigating." 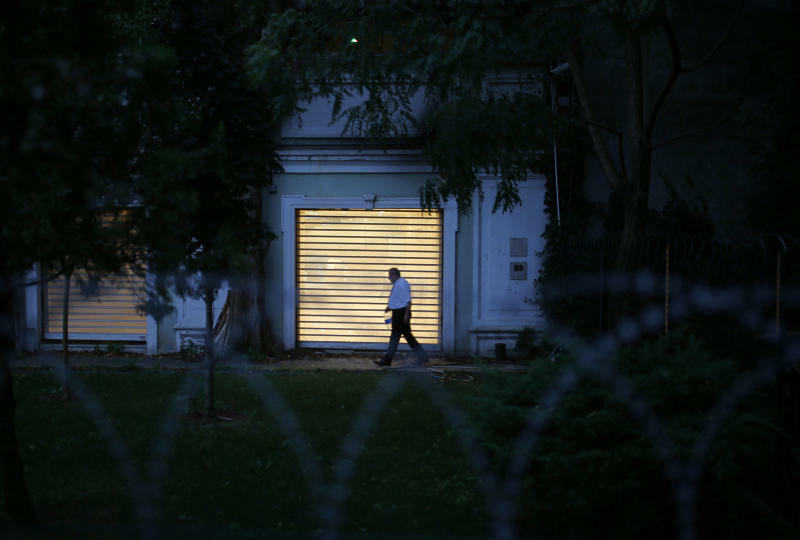 Turkish forensic teams earlier this week searched the consulate building where Khashoggi was last seen entering two weeks ago. A senior official told The Associated Press that investigators had found more evidence indicating that the journalist was killed there. A strongly pro-government Turkish newspaper has published a gruesome recounting of the alleged slaying of Saudi writer Jamal Khashoggi at the Saudi Consulate in Istanbul. Yeni Safak on Wednesday cited what it described as an audio recording of Khashoggi's slaying, which it said showed the Washington Post columnist was tortured. The newspaper said Saudi Consul General Mohammed al-Otaibi could be heard on the tape, telling those allegedly torturing Khashoggi: "Do this outside; you're going to get me in trouble." The newspaper said one of the Saudis torturing Khashoggi replied: "Shut up if you want to live when you return to (Saudi) Arabia." Saudi officials have not responded to repeated requests for comment from The Associated Press in recent days. The kingdom has previously denied allegations that Khashoggi was killed. Security services in Turkey have used pro-government media to leak details of Khashoggi's case, adding to the pressure on the kingdom. U.S. Secretary of State Mike Pompeo has landed in Turkey to discuss the disappearance and alleged slaying of Saudi writer Jamal Khashoggi with authorities there. Pompeo arrived in Ankara, the Turkish capital, on Wednesday after visiting Saudi King Salman and his son, Crown Prince Mohammed bin Salman, the day before. Before leaving Riyadh, Pompeo said the kingdom promised a "transparent investigation." Asked if that would include members of the royal family, he said: "They made no exceptions on who they would hold accountable." Khashoggi vanished Oct. 2 during a visit to the Saudi Consulate in Istanbul. Turkish officials say Saudi agents killed and dismembered the Washington Post columnist, who had written opinion pieces critical of the crown prince. Saudi Arabia initially called the allegation "baseless," but reportedly may acknowledge Khashoggi's slaying, perhaps as part of a botched interrogation. U.S. Secretary of State Mike Pompeo says Saudi Arabia told him their investigation into the disappearance and alleged killing of Saudi writer Jamal Khashoggi won't spare anyone, including royals. Pompeo told journalists Wednesday morning before flying to Turkey that the kingdom promised a "transparent investigation." Pompeo said: "They made a commitment to hold anyone connected to any wrongdoing that may be found accountable for that, whether they are a senior officer or official." Asked if that would include members of the royal family, America's top diplomat said: "They made no exceptions on who they would hold accountable." Khashoggi vanished Oct. 2 on a visit to the Saudi Consulate in Istanbul. Turkish officials say Saudi officials killed and dismembered The Washington Post columnist.